What was I thinking? The day before we left for Thanksgiving with the rellies, my farmer friend dropped off some lamb bones she didn't have time to deal with. When she called to ask whether I wanted them, she didn't mention that they were huge, nor that she was talking about 15 pounds or so of bones with plenty of meaty bits on them. But how could I say no? These were lamb bones from her own pastured animals fed an organic diet. I rarely turn down free offers, and this certainly wasn't going to be one of those occasions. Silly me, I thought it would be a good idea to warm the house up by roasting the bones and making stock out of them the day before we left home. Honestly, there wasn't much choice, since the apple cider had taken up all the free space in the freezer. The bones wouldn't have fit in there to be dealt with later. It was a very cold day, and the soup I incorporated it into for dinner that night did hit the spot. There were so many bones I couldn't easily fit them all in my largest skillet, a massive 15-incher. They were fatty enough that they needed no extra oil. A few peeled carrots formed a bed of sorts for the bones at the bottom of the skillet. I rummaged around in the freezer until I came up with my bag of saved parsley stems. Leek greens salvaged from a few homegrown leeks adorned the bones as well. The bones produced an intensely meaty smell as they roasted. Unfortunately, only the top ones were getting brown, so after the first hour and a half, I removed the top ones to let the lower ones darken too. When they were cool, I realized that neither were they going to fit into my two largest stock pots. I had to ask my husband to get out the (rarely used) cleaver and the protective eye wear. He swung the cleaver, marrow and bone bits flew everywhere, and some evidence was left on our now properly christened butcher block. Into the pots went the bones, the deglazed roasted carrots, and deeply charred leek greens. There were so many bones that I only simmered them for about an hour and a half. By that time the flavor was almost too intense. Normally, I would have been a glutton and let it simmer for 3-4 hours, but time was short that day. Some of the stock went into a harvest meal soup, which I'll post about soon. I had to dilute the stock by about 50% for the flavor not to overwhelm all the other ingredients. The rest of the highly concentrated stock filled up eight (!) quart containers. The diluted lamb stock was all the meat we needed in an otherwise vegetarian soup. It's nice to feel that we helped thoroughly use up this animal, so that less of it went to waste. I feel it's more respectful of the animal's life to value and use every bit of it. It also pleased my frugal side to wind up with two gallons of double strength lamb stock for a material outlay of about 15 cents. 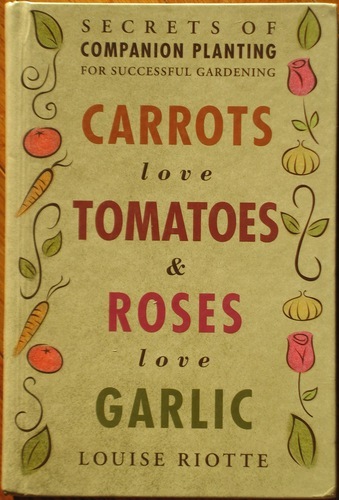 (The organic carrots were store bought in bulk.) This rich ingredient will form the basis of many, many meals for us. I've also gotten an invitation from my farming friend to make haggis the next time she slaughters some lambs. That will use up the lungs, heart, liver, tongue and stomach of the animal, parts that in the past have been feed to her dogs or gone to waste entirely. 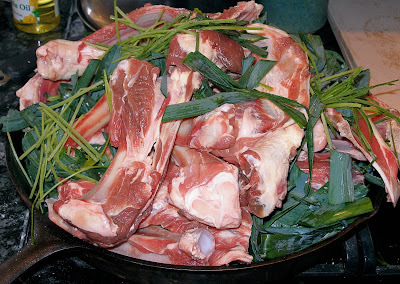 the skin and the legs of animals (shanks, feet) add gelatin to the stock. If you want a gelatinous stock, include them. If you want a thin stock, don't. Before getting back to our regularly scheduled content after the holiday, I'm going to make a plug for one of my favorite organizations, and a great upcoming opportunity for anyone who takes food issues seriously. PASA is the Pennsylvania Association for Sustainable Agriculture. They're a non-profit group of farmers, consumers, and those of us who are sort of in between, who work to address issues of sustainable farming, local food, and food quality. I don't think of PASA as a faceless group, or a non-profit entity. When I think of PASA, I think of the real people I know, small scale farmers who still give a damn about the food they produce and the people they help to feed. I think of the incredible wealth of knowledge that I have access to because of PASA, the contacts I've made, mentors I've met, and the local grass-fed and -finished prime rib of beef I'll be preparing for Christmas dinner. Each year PASA holds its annual Farming for the Future Conference in State College, PA. It's held in chilly early February, about the only time of year farmers in these parts can reasonably be expected to get away from their farms. I've attended this conference for the last three years, and I plan to do so next year too. Every single year I've come away energized, excited, having made new contacts, and having learned invaluable things that I, a dabbling homesteader, can take home and put into practice on my 2/3 acre suburban lot. Most of the people who attend are Pennsylvania farmers, including many Amish, but I've met many plenty of non-farmers and folks from Vermont, Ohio, Maryland, New York, and Virginia too. If your interests include high quality food, gardening, homesteading, crop or livestock farming, building local economies or viable communities, local food, organics, post petroleum age sustainability, value added farm products, community supported agriculture, or anything loosely connected to these issues, you'll find something of interest at the PASA conference this coming year. PASA always assembles a stunning roster of speakers and presenters. These are people of long experience and great vision, who know their topics intimately. At past conferences I've heard Joel Salatin and James Howard Kunstler speak, and gotten tips on growing apples from the likes of Micheal Phillips. I've heard the first hand accounts of two young entrepreneurial micro-farmers who sold more than $60,000 worth of produce grown on one acre of land on the Winooski River in Vermont, and another farmer in northern Maryland who sells fresh greens from his open fields year-round, even when he has to harvest them from under the snow. The conference proper is always on a Friday and Saturday. But there are intensive, all-day, limited-enrollment seminars as optional add-ons before the conference itself gets underway. There are a number of tempting offerings for next year. I'm considering the Wednesday Weed School and the Thursday Hands-On IPM and Biocontrols track. I would really like to learn more about pest management, and how to distinguish the eggs of the beneficials from those of the pests. Although this will be an expense I consider a luxury, I have no difficulty making the decision to attend. Carpooling has been easy to arrange each year, and I've yet to pay for lodging while attending the conference. PASA takes pains to keep this conference affordable, and offers many discounts that may reduce the expense of attending. Farmers are not wealthy people, sadly. Though there is an optional meal plan offered with registration, I've found that just grazing on the abundant and delicious donated snacks has been sufficient to cover my caloric needs while at the conference. In fact, I usually come home with food. In the end though, the few hundred dollars I cough up to PASA goes to a cause I firmly believe in. And I definitely get my money's worth. If you're in or reasonably near Pennsylvania, check out PASA and their 2009 Farming for the Future Conference. If you plan to attend, please let me know in the comments. Maybe I'll see you there! This is a quickie post before I dash off tomorrow for the holiday with distant family, inspired by CG's post on participating materially in our own lives. This post spoke to me in a weird way. Have you ever read something, or had someone say something that sums up a bunch of random thoughts that have been knocking around in your subconscious? That's sort of what the Contrary Goddess' post did for me. I'll be largely absent for the next week or so. I've got a bake sale to prepare for tomorrow, and then we'll be away for Thanksgiving. I am SO looking forward to December, which I think may finally be the month I get to relax for a bit. It's well into autumn here. We've had a little snow already. That only makes it more satisfying to still be eating out of our garden. It was a little melancholy yesterday afternoon, to wander out to the garden, picking up a few stray groundfall apples from way high up in the tree, farther than our ladders would reach, and then to catch sight of the empty chicken pen. Our girls have gone to their winter home. We no longer have an imperative that drives us outside twice a day whether we feel like it or no. But there is still Tuscan kale in the garden, looking for all the world like miniature palm trees, clearly enjoying the chilly weather, and next to them the colorful rainbow chard. A little ways away the leeks stand, green bits akimbo, in a disheveled looking row. I tucked a good bit of hay around them yesterday, to keep the worst of the chill away from them. They'll be fine in their hay blanket for several weeks more at least. I counted 14 of them, and picked a fat one out for our dinner. I also snipped off a generous bunch of only lightly munched upon Tuscan kale leaves. Inside, I blanched the kale to remove a few caterpillars and detritus, and rinsed it well. Then I began a pasta sauce based on sliced garlic sauteed in a little olive oil along with that fat leek, finely sliced up. While those softened in the oil, I finely diced the kale. That was then added to the garlic and leek with a jar of the roasted tomato sauce I canned this summer. -Four homegrown ingredients at the heart of our meal. When all sauce ingredients were warmed through, I added white pepper, salt, and about a cup of heavy cream. That simmered and reduced slightly as the pasta cooked. 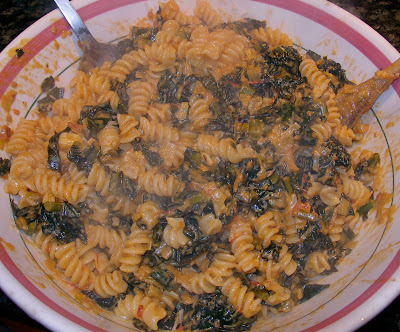 Once the fusilli were at the al dente point, and sauced with this vegetarian sauce, I added a generous handful of grated parmesan cheese. It tasted quite good. As always, even better than a tasty meal is a tasty meal produced in large part from our own labors. We didn't produce all the ingredients ourselves, but we know we cut our food miles significantly by growing what we eat and eating what we grow. Well, it was a big weekend. We got our apples pressed, and the laying hens passed on to my real farmer friend, who will keep them for us until spring. She and her family showed up briefly during our apple pressing to pitch in for a bit and press a small batch of their pears into pear cider. We put off the pressing from Saturday to Sunday to avoid the heavy rain on Saturday. Instead we were graced by the first snow flurries of the year as we turned our apples into delicious cider. The apple press we use is around 100 years old and is located in a huge barn, which provides some protection from the wind. 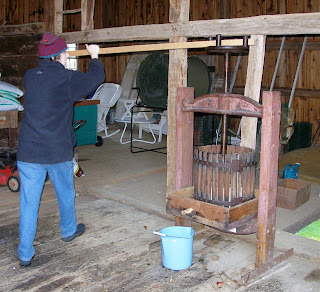 My relatives bought the apple press for a song at an auction many years ago. When we first arrived, I uncovered the apple press and found a mouse nest in the juice box, made up of chunks of fiberglass insulation. Needless to say, the press needed several good scrubbings and a little bleach before it was ready for use. Fortunately, I didn't find any critters in the nest. 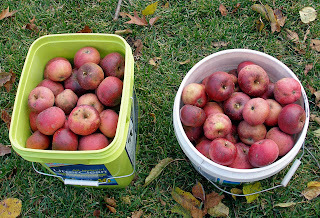 After cutting out the worst blemishes, giving the apples a triple rinse, and grinding them by hand with an old-fashioned apple grinder, the fruit was loaded into net bags. The net bags are placed in the hopper of the press, and then we crank down the screw. It takes some effort to turn the screw once it's fairly tight. We use the mechanical advantage of this pole. After ten minutes under heavy pressure, enough juice has left the apples that the screw can be tightened further for a little more extraction. The juices begin to flow. 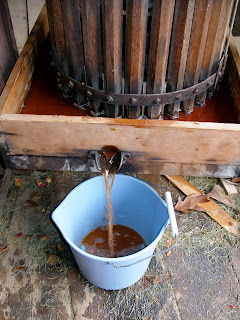 There's nothing in this world that tastes like fresh apple cider you've just pressed entirely by hand. Freezing preserves the cider, but the taste of this brown nectar is unmatchable. 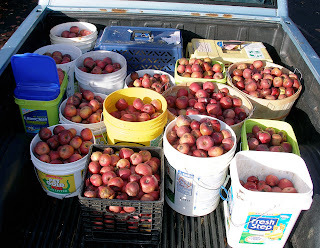 And here's a picture of our cider yield. Pretty dramatic reduction, huh? Well, we did get a little more cider than is shown here. 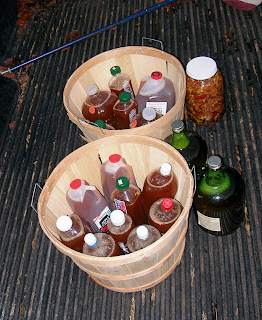 We gave some to our friends who helped us with the pressing, and they gave us a little bit of their pear cider. And of course, we had to sample the cider as we were making it, for quality control purposes. We also gave half a gallon to my relatives who let us use their massive old apple press. They told us repeatedly that it was the best apple cider they'd ever had, which is saying a lot, since they had freshly pressed apple cider from their own press last year, and apple cider is fairly common where we live. Really good apple cider is usually made with a combination of different apple types too. We had only the apples from our own tree. Speaking of our mystery apples from our old, old tree... During our lunch break we took a look at an apple variety book that my relatives had. We now think it's a decent bet that we have either a Winesap or a Stayman-Winesap tree. I lean more towards the Stayman-Winesap on the basis of the color of the flesh, which is greenish-yellow, and on the extremely late harvest of the fruit. Winesaps apparently have more yellowish flesh and a wider range of harvest dates. Both varieties have a squat shape, crisp texture, and dull red skin with tiny white flecks. Our farming friends hauled away all the bad spots trimmed from the apples for their chickens, and all the pomace (solids left after pressing) for their goats. It's cold enough now that the pomace probably won't ferment on its own, so she can feed it to them over the next few days. I speculated that the goats probably wouldn't object if the pomace did ferment. Speaking of fermentation, I heard something, possibly a rumor, that I'm going to try out this year. Apparently, one can take the apple pomace and put it in a crock with water just to cover. Cheese cloth should be laid over the rim and tied off and the crock left in a dark area. Supposedly, it'll eventually turn into apple cider vinegar. That wide mouth jar next to the bushel basket in the last picture contains the beginnings of the experiment. I don't know if this will work, but since the ingredients are free I have nothing to lose by trying it. Any wagers? Any actual knowledge? I'm looking forward to seeing how this goes. Note: Results of the apple cider experiment are now posted. Now that the weather's turned cold, I'm returning to wintry ways with breakfast. Hot breakfasts are so welcome at this time of year. After an indispensable large cup of tea, I'm eating oatmeal again these days. Even with rising food prices, rolled oats are still an excellent value, and they're a good way to incorporate whole grains into your diet. Steel-cut oats are good as well, but they tend to be more expensive, and I've found that I get hungry sooner after eating steel-cut oats as compared with plain old rolled oats. I appreciate oatmeal because it can be accessorized in so many delicious ways. I grew up on the sugar bomb instant oatmeal packets, while my husband's family favored rolled oats garnished with salt and butter. Both of us retain those preferences. I still like maple syrup on my oatmeal; he still likes it savory. Right now we have apples coming in from our apple tree. So I've been cutting one up each morning to add to our oats. I used to add sliced bananas before we began trying to eat more locally. Dried fruits are great too. I'm particularly fond of golden raisins, but just about any dried fruit will work nicely. 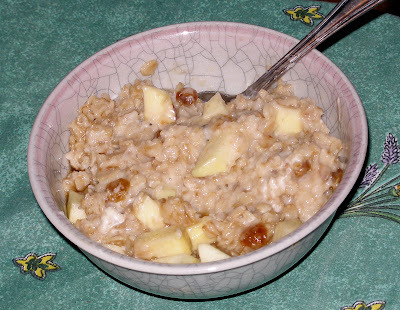 We're not afraid of fat in our household, so we often add some of that to our oatmeal. I used to favor a tablespoon of heavy cream drizzled over my bowl of oats in the past. More recently, inspired by that wicked idea of Mark Bittman's , I've started adding a tablespoon of cream cheese paired with a small shot of maple syrup. Old fashioned rolled oats cook so quickly that there's really no justification for quick oats. Five minutes is all it takes. If you really want to, feel free to cook it for 20 minutes to produce a mushy porridge. The nearly al dente version appeals more to me. I usually add the smallest pinch of salt to the water when cooking the oats, and any other powdered spices I want to flavor it with. The rest of the ingredients can be added after the oats have cooked. Home cooked oatmeal is a much better choice than breakfast cereal, in my opinion. It's usually cheaper per serving, even if you jazz it up with nuts or fruit. At bulk prices, the organic oatmeal in the photo above cost me 21 cents. True, the additional ingredients cost me something, though the apples came from our tree. But how much could a few raisins and a dollop of maple syrup really add up to? Certainly well under a dollar all together. Additionally, by preparing your own food, you avoid the chemical additives and refined corn sugar that are nearly universal in breakfast cereals. You can control precisely the sweetness and the amount of fat in your food. There's less packaging to throw away. And you get a warm breakfast that delivers sustained energy for several hours. What could be better than that? It's a rainy day, and I've been slaving away over 16 batches of bread lined up to bake today. Since I'm hanging out so much in the kitchen, and since the flour will pretty much cover half the horizontal surfaces of the kitchen anyway, I've got a little treat lined up for between oven loadings and unloadings. But first I'm going to write a little on the primary ingredient of said treat: scallions. I didn't grow any onions this year, so the various forms of onions are among the few items I've been buying from the store all along. Scallions are some of my favorite cooking ingredients, though they are quite pricey as produce goes. So I thought I would share a few tips concerning them. Storage: I think most readers will have heard the tip about wrapping the bunch of scallions in a paper towel and then wetting it down before storing in a plastic bag in the fridge. This is a good tip, provided that the paper towel isn't soaking wet. Damp but not drenched will do better by the scallions. This will let the scallions keep for about three days in the produce bin, but they deteriorate rapidly no matter what you do. Have a specific plan to use them up before you buy scallions, or pull them from your garden. Black belt frugality move: When you're ready to use up the last of the scallions, there's no need to throw away the paper towel. It never really got dirty, right? Hang it up to dry somewhere and later on you can use it to wipe up a spill. Using them up: Lots of recipes call for either the white part or the green part of the scallion. And plenty of other recipes use whole scallions, but not an entire bunch. So what to do with the extras? There are lots of good things to do with them. The green parts make excellent garnishes for many dishes, especially those with eggs or potatoes. One of my favorite things to do with leftover scallion whites is to trim off the roots, cut the whites in half lengthwise, and then turn them into a gourmet salad ingredient. I separate the long layers of the whites and toss them in a skillet with a little bit of cooking oil. Over very low heat, I let them slowly caramelize until they are well browned and have transformed into crispy, oniony decadence. Put these in a green salad and watch as people fight to get more than their fair share in their salad serving! 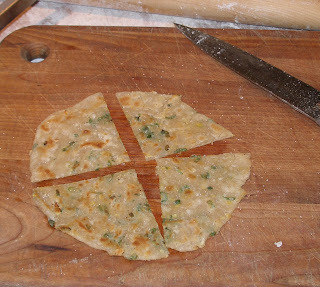 So here's where the treat comes into play: scallion pancakes! There are lots of versions of scallion pancakes. Some are leavened, some have egg, some are flat and greasy. 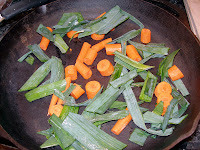 The version I make is the flat and greasy type, and I gild the lily by loading them up with ginger and garlic as well. Here's what I do. Start with a quantity of all purpose flour. I usually use 1 1/2 cups. Measure out however much flour you want to use and place it in a bowl with a generous pinch of salt. Add half a measure of boiling water. So, in my case, I add 3/4 cup boiling water. Stir the flour and water around with a spoon. Avoid the temptation to start working the dough with your hands as you will probably burn yourself. The dough will look odd and lumpy and rough and uneven. That's okay, just make sure all the flour is absorbed into the dough. Take the dough out of the bowl, pour in a small dollop of cooking oil, and put the dough back in the bowl. Turn the dough to coat it with oil on all sides. Cover the bowl with a plastic bag or plastic wrap and refrigerate for 2-24 hours. Take the chilled dough out of the refrigerator. Finely slice a quantity of scallion greens. Mince a large clove of garlic very fine, and peel a 1" cube of ginger. Mince or grate the ginger cube. (The America's Test Kitchen has found that grating releases more flavor than mincing from an equal quantity of ginger.) Set each of these ingredients aside in separate containers. Dust a board or countertop generously with flour. 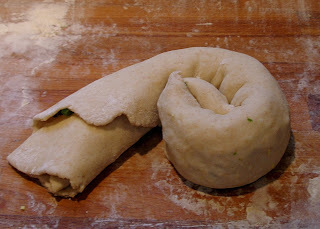 Roll out the dough to form a large circle, between 1/8" and 1/4" thick. Brush the dough lightly with cooking oil so that the entire surface is coated. 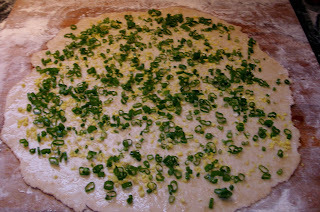 Scatter in turn the minced garlic, the ginger, and the sliced scallions evenly over the surface of the dough. 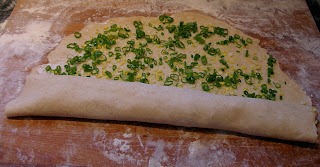 Starting at the edge of the dough nearest to you, roll the dough and the seasoning ingredients up like a jelly roll. Then, beginning at one end of the log, roll it up like a spiral snail shell. Put this package back in the oiled bowl, turning it again to coat on all sides. Refrigerate the dough again for at least 1 hour. Dust the board generously with flour again. Take out the dough and knead it gently for a few minutes, to distribute the ingredients and obliterate the layers. Form a roughly cylindrical log, about 2" in diameter, with the dough and let it rest for 5 minutes. Cut off a coin-shaped slice of the log and roll this out in a thin pancake, about 4"-5" in diameter. Pan fry the pancake in cooking oil in a well seasoned skillet over medium to medium-high heat. Allow about 2 minutes per side. If the pancake domes up with steam underneath, poke a hole in the middle to let it escape so that the whole pancake cooks, rather than just the edges. Drain on pages torn from an old phone book. If you like your snacks very salty shake some salt on the pancake just as it comes from the pan, or if you prefer, dip in soy sauce. Serve whole or cut into wedges. These are absolutely irresistible! One batch will make quite a few pancakes. The dough will keep in the fridge for two days. After that it begins to discolor, though there's nothing spoiled about it at that point. Better to keep any dough you don't plan to use up in the freezer though. You can cut it into chunks for quicker freezing if you plan to only make a few at a time. That makes this recipe a good way of salvaging food that would otherwise go to waste. The tiny little ears of the Tom Thumb dwarf popcorn I grew sat around in an open basket for a couple months after I harvested them. Some of them may have been harvested a little early in my eagerness. The ones I harvested late seemed to have slightly larger and plumper kernels than the first ears I picked. Shucking the ears wasn't so taxing, but getting the kernels off the fully dried cobs was a little rough on the hands. And then to winnow away the chaff. I discovered something interesting during the winnowing process. I started with a shallow sided, tightly woven basket. That didn't work so well, because hard dried popcorn bounces like mad. So when I agitated the kernels, it bounced right off the basket and onto the ground. I quickly traded up for a large, round, straight-sided food storage container. It's a wide, squat cylinder, with sides about 4" high - too high for the kernels to bounce over if handled gently. After only a few swirls of the kernels in this container, I discovered that the build up of static electricity was causing the papery bits of cob and the dried out corn tassels to cling to the inner walls of the container. It was easy to sweep these out of the container with my hands. The more I shook the kernels around, the more static electricity built up. Some of the tiny, undeveloped kernels were light enough to also stick to the plastic sides. This made the winnowing process fast and easy. I was delighted with my discovery! The popcorn we grew was a dwarf variety (full jar on the right), so it was no surprise that the kernels were significantly smaller than the store bought variety (jar on the left). What struck me though was how much deeper was the color of my homegrown popcorn. The store bought stuff, although organic, just looked pale and washed out compared to my deep yellow-orange homegrown popcorn. I'm guessing that this means our popcorn is higher in beta carotene than the store bought. It popped up very well too, though the smaller popcorn flakes made a much smaller bowl than we're used to. It tasted great. I started the season with exactly 42 kernels of popcorn to plant. After germination, those were thinned to 15 plants. And those 15 plants gave us four cups or 2 pounds of popcorn. I can really see the benefit of keeping good planting and harvest records of the garden. It's so satisfying to have these numbers. More satisfying still to eat a bowl of popcorn we grew ourselves, topped with garlic butter made with our homegrown garlic! In other news, I love autumn! Our apple tree finally finished up the business of ripening this year's crop. We've harvested most of them in the last few days. The sweetness of apples now hangs heavy in the garage. Our old tree is obviously a late variety, but as it came with the house when we bought it, we have no clue as to the name of these apples. If you think you know what apple variety we've got, please say so in the comments. Our tree is in southeastern Pennsylvania, and has got to be 50 years old at the very least, possibly 75 years old. So it's not some new-fangled variety. The flesh is firm and crisp with a nice balance of tartness and sugar. I like picking apples. There's something a little meditative and satisfying about it. It's not like any other harvesting I do. Instead of squatting down to tug something out of the earth, or bending low to cut, I'm reaching up, high above my head, trying to avoid being poked in the face by branches. Ladders, and precarious balancing are involved. The sheer quantity of apples is always a little astonishing too. 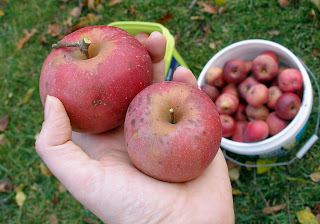 The picture below shows two picked apples. You can see a cleanly broken off stem on the smaller apple. It was picked correctly when it was ripe. The larger apple is also ripe, but when I picked it, I snapped off a part of the woody branch too. This is very easy to do if you yank the apple, or try to pick too early. And sometimes it happens even when you do everything right. Breaking off part of a branch near where a stem attaches is not good for next year's harvest, because the blossoms will reform in pretty much the same place year after year. So that little piece of wood attached to the larger apple's stem means no more blossoms from that part of the branch where this apple grew. Even if you only glean apples from a tree belonging to someone else, it's a good idea to take care when picking apples, so as not to significantly reduce next year's crop. You can also see some dark spots on the apples in this picture. That's sooty mold. It's harmless, and it washes off with a good scrub, but it is rather unpleasant looking. Many of our apples have a lot more sooty mold than these two. I've been told that baking soda sprays during the summer can help prevent or limit the sooty mold. Proper pruning also reduces the severity of sooty mold by increasing the air circulation and the amount of light the apples get. Tidiness around the tree and the removal of all leaves over the winter is supposed to help too. Apparently the fungus overwinters on the fallen leaves. So if they're all removed to a good distance - or better still, burned - it's supposed to help next year. After a good pruning of our tree early this spring, we're definitely seeing less sooty mold than last year, even though we never got around to the baking soda spray. We're letting the apples "sweat" a little bit in the garage, and we plan to press them into cider this coming weekend. The aroma of apples almost knocks me over whenever I go out there. The sweating process lets the apples lose some moisture so that their sugars concentrate, producing a sweeter cider. Ideally, they'd sweat for two weeks or more. But our schedule won't allow that for the bulk of the apples. 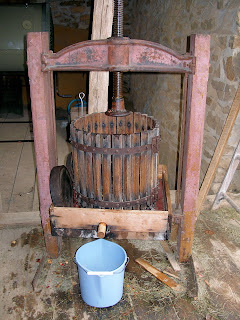 We use a massive old apple press that belongs to a relative. I'll post some pictures when we do the pressing. I'm far from an expert on growing apples, or making cider, but I do have reading recommendations if you want to learn more. 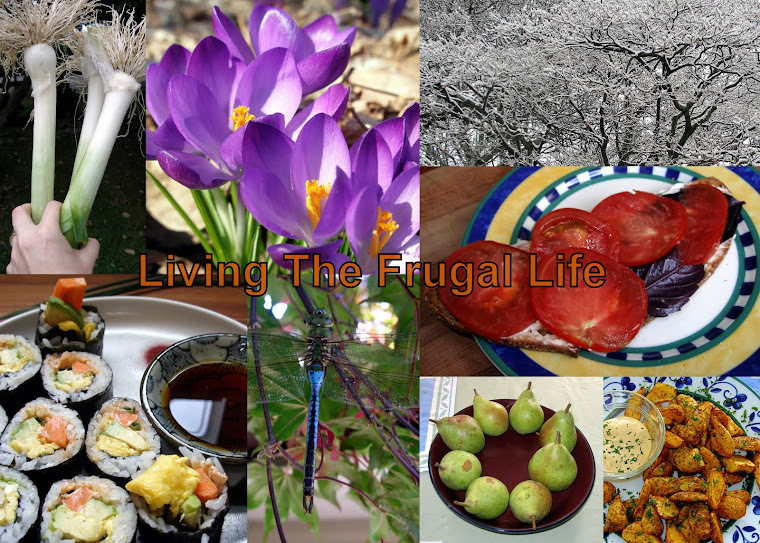 I've written before on frugality creep, and the incremental changes that happen when saving money becomes a mindset, a way of life. It's very difficult - and very uncomfortable - to shift too quickly from an average endebted, consumeristic lifestyle to severe pennypinching. In our lives the shift from spending to saving has been gradual and is ongoing. For me there were certain big changes that happened early on, mostly the obvious ones: keeping and using a price comparison book, switching to CF light bulbs, hanging all my laundry up to dry, eating out less and less, learning to bake bread, selling off extra vehicles. But even as I enthusiastically set aside old habits and took up new ones, there were certain exemptions to my spending habits that I wasn't even willing to consider giving up. I think that's normal, and if you're new to frugality I think it's okay to devote your energies to learning new habits and skills for the time being. But when the new habits and skills have become routine, and the frugality bug has still got you bad, there comes a time when those exemptions start looking more and more profligate. Then it's time to reconsider them. Confession time: I'm vain about my appearance in one particular way. I always wear foundation makeup when I'm out in public. I don't wear lipstick or eye makeup more than a few times per year, and most of the time I couldn't care less what clothes I'm wearing (so long as they're clean and warm enough). But for many long years I've spent good money on a cosmetics counter brand of foundation. I go through about two and a half bottles per year. That probably adds up to about $100 per year. This was something I just wasn't willing to consider cutting out of my budget for quite a while. It quietly held non-negotiable status, and was paid for out of my mad money budget. Now you may argue that $100 per year isn't very much money, and that's the exact argument I made to myself. But $100 is $100, and there are lots of efforts I make to save us even smaller amounts per year. Why turn around and blow that much on a non-necessity? So recently I decided that I needed to at least consider some alternatives. If I couldn't simply give it up and let the world see my splotchy skin and the occasional zit, then I would at least try a cheaper brand. Off I went to visit the drugstore cosmetics aisle, a trip I hadn't made since high school. You know what? On my very first try I found a product that matches my skin tone, has a good SPF rating, and works just about as well as the high end stuff I've been buying for years. It's a little bit thinner than my usual brand, so I may use a little more each day. But it costs less than a third as much for the same size bottle of the expensive stuff I've used for so long. I feel pretty foolish for having let a mental prejudice get in the way of saving money for all these years. And I feel silly for still refusing to be seen without foundation. But I do feel good about finding a cheaper alternative that works. Now I have no reason to go to the mall, ever. We still have some non-negotiables in our budget. I'm not thrilled about these, but unless and until the feces really hits the rotating oscillator, my husband isn't giving up his beer, and my dirty little canned soda habit will continue. What are your non-negotiables? Have you managed to overcome any? Please share in the comments! I'd been ignoring the gorgeous rainbow chard out in the garden for quite a while. During the summer, I diligently processed large batches of it and stored them away in the freezer. But I quickly tired of this because the cleaning process for chard was so very labor intensive. The undersides of the leaves can get very dirty during a heavy rain. The dirt splatters up from the ground and then sticks to the crinkly undersides. Fortunately, chard can handle being ignored so long as it gets enough water, and I think the benign neglect even helped the dirt problem. You see, as new leaves formed in the center of the plant, the older and larger leaves that hung around, unpicked, shielded the new inner leaves from that dirty splatter. Ignoring the chard worked in our favor after a while. So when it was time to harvest a big pile for a favorite curry, the cleaning was a little easier this time. 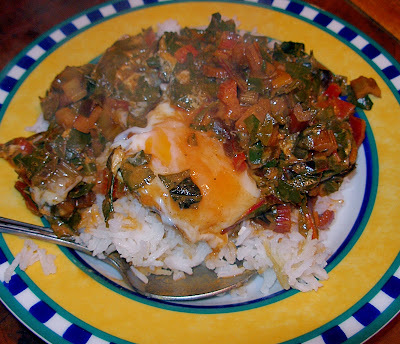 Egg & chard curry is one of my husband's favorite meals. I make absolutely no claims to authenticity with this dish; it's just something I came up with that we both really enjoy. It tastes even better to us when we use our own chard and garlic, plus eggs from our own hens. I'll describe how I make it. You will need a surprisingly large pile of chard. It cooks down very significantly, so you'll want a lot to start with. If you're buying it in the store, you'll need at least three bunches, and four or five is better. Wash the chard, separate the leafy parts from the stalk and rib, and chop the stalk/rib portions into 1/2" pieces. Cut the leafy parts into a 1" dice. Set these aside in separate bowls. Preheat a very large skillet over medium heat. When hot, cook the onions in a generous amount of clarified butter or cooking oil. Let the onions soften without browning, stirring occasionally for about 5 minutes. Add the ginger and garlic and continue cooking and stirring for two more minutes. Add a generous pinch of salt and 3 tablespoons of Madras curry powder, or to taste. Stir the ingredients around so that they are coated with the curry powder and all the curry powder is moistened by the oil. Cook for three minutes, stirring often, and reducing the heat if necessary to prevent burning the curry powder. Stir in the chopped ribs and stalk of the chard, and increase the heat to medium high. Cook for several minutes, until the vegetables begin to soften and release some liquid. Add the chopped leafy parts and stir well. When all of the leafy chard has begun to wilt and release liquid, add the tomato paste and stir to incorporate it into the ingredients. Shake the can of coconut milk, open it and add it to the skillet. Rinse the can with water to claim the last bit of coconut milk and add that to the skillet. There should be enough liquid in the pan to at least half way submerge all the solid ingredients. Add more water if necessary. Add a little black pepper. 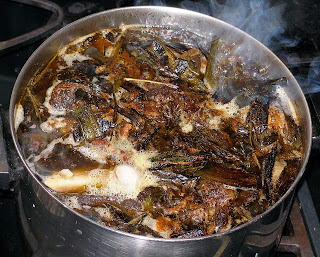 Reduce the heat to medium and allow the chard to continue cooking in the added liquid for 3-5 minutes. Add the lemon juice and stir to incorporate. Taste the curry and adjust the salt and other spices to your personal preference. If you want to add more curry powder, simmer at least 3 additional minutes before proceeding. Now take a metal spoon and scoop up some curry near, but not right up against, the edge of the pan. Set the filled spoon down on top of the curry without spilling it. There should be enough liquid in the pan so that it pools into the area where you just scooped out the solids. Crack an egg into that little hole, and place the chard you scooped out on top of the egg. Repeat this process around the edge of the pan, keeping each egg in its own hole, somewhat separated by the rest of the ingredients. Don't worry if the whites run a bit. When the edge of the pan is full of eggs, add one more egg in the center. Reduce the heat to the barest simmer for 8 minutes and let the eggs poach undisturbed. Gently peek under the chard and check the consistency of the eggs. If you want the yolks hard, continue cooking for another 5 minutes or so. If the consistency is good or nearly so, turn off the heat and let the curry rest for a few more minutes. Serve over steamed basmati rice, or with Indian flat breads. Garnish with the cilantro or scallion greens if desired. Yum! Serves 4-6. Leftovers are good, but if you don't want to overcook the eggs, you may want to fish them out and gently heat them after the other ingredients are warmed through. I'm late! I'm late! For a very important date! The late season planting date, that is. Although I worked a larger garden this year than I ever had before, I still feel like a slacker. An extended growing season really isn't part of my garden repertoire so far, though the advantages are obvious to me. I have no greenhouse, no row covers, and I didn't manage to get a second crop of anything in for fall harvest, not even lettuce. And it's pretty late to do anything about it now, in November. But if I'm not the most diligent gardener, I am willing to gamble on long shots. But in this case, I'm hedging my bets. I've come up with a crude coldframe idea, and I'm going to run a little experiment. What I'm trying to grow is arugula sylvetta, (also known as rocket) a very hardy and very tasty salad green. It's tough enough to germinate at temperatures as low as 40F (4.5C)! And it may be my favorite salad green of all time. We especially love it tossed on thin crust pizza just as it's pulled from the oven. I'm going to see if it can be coaxed into producing a winter crop for us when planted this late in the season. Here's the set up for my experiment. We picked up some older bales of hay from the farmer who leases and farms our farmland. He declined to charge us anything for them. (He'll be getting a few loaves of my homemade bread next time we're up there.) If he'd had any, we would have taken bales of straw, to avoid bringing seeds into the garden. I arranged four of the bales to form the sides of a small impromptu coldframe, which I'll use only over this winter. I call it the hayframe. In spring, the hay will be turned into garden mulch. Hay is a good insulator that breathes well, and it's biodegradable. Best of all, constructing the walls of my coldframe took less than five minutes and cost me nothing. If you had to pay for four bales of hay, it would almost certainly cost no more than $20, and less if you live outside of a city. Straw bales may be even cheaper. 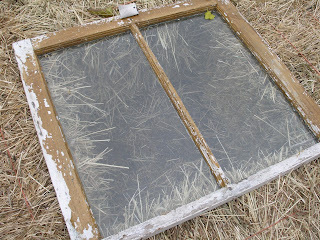 The top of my hayframe is a weather beaten window I picked up from a typically frugal old time Pennsylvania Dutch man. Throw it away? No, ma'am. He set it out in the yard with a for sale sign. I got it for $2. 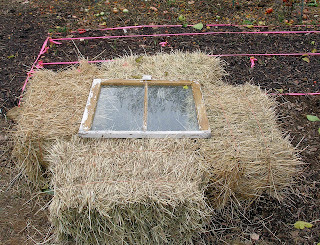 I pinwheeled the bales of hay to create an opening just slightly smaller than the outer dimensions of the window. The slight overlap of the bales at each corner provides extra insulation, at least in theory. In reality, hay bales aren't as uniform or as solid as bricks, so there are gaps and irregularities. The window simply lays on top of the bales, so the seal isn't great to say the least. But I guess I've got what I paid for. I did stack the hay bales so that their shortest sides are the vertical rise of the coldframe. 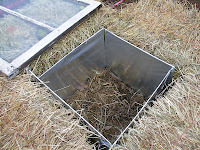 That means that whatever warmth is collected inside the hayframe will stay as close to the ground, and the plants, as possible. I'm counting on the cold tolerant arugula to make this setup work for it. In hardiness zone 6, I know I'm asking a lot from these seeds, planting them in early November, though we are having unusually warm weather this week, which may make all the difference. To give the plants a little more advantage in this marginal environment, I pulled a few tricks out of my bag. First, I aligned the coldframe to face south, so that it ekes out as much solar exposure as possible. I also cut pieces of cardboard to fit each hay "wall" of the hayframe, and I covered these with aluminum foil, shiny side showing. This will bounce whatever sunlight comes into the coldframe around very well, so that the growing plants get as much sunlight as possible. I haven't done this yet because it has been fairly warm, but I may also put two bricks in the cold frame, one at either northern corner. These bricks will soak up the solar energy each day and get somewhat warm. During the night, they'll slowly release that warmth, giving the plants a small temperature advantage. Placing them in the corners will assure that they won't block too much of the sunlight reflected from the aluminum foil, and they won't shade the plants directly either. I'm going to wait to see what the daytime temperatures are like in the hayframe on a cold sunny day, the next time we have one, which may take another month. I'm pleased with this little project because it puts stuff we've got lying around or very cheaply available to us to good use, at least potentially. I'll be even better pleased if it works. Plenty of things may go wrong with this experiment. Field mice could invade the hay bales. They might enjoy arugula. The window frame is also going to collect precipitation, leading to rapid deterioration of the wood. But that's just something I'll have to live with. 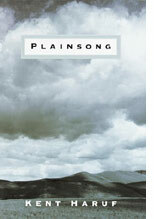 Or, I may just have left the sowing too late. So, we'll see how the arugula seeds fare. I'll let you know how it goes. Note: Preliminary results of the hayframe experiment are now posted. So I'm in a quandary this week about my four laying hens. Since early summer I've been mentally preparing myself for their slaughter. I've never slaughtered an animal before, though I have done some butchering. There are lots of reasons I'd made the decision not to keep them through the winter, none of which would have made sense had I put the decision to the hens. These girls are more than two and a half years old; well past "retirement age" for the average layer. That means they produce fewer eggs and will only grow less productive as time goes on. I don't have a way of keeping the hens warm through the winter. The shorter hours of daylight over the winter will also mean less and less productivity from the hens. These animals are not pets, though I consider their care and well being a solemn duty. But the most important reasons I have for making the decision to slaughter these hens will sound nonsensical to some people. I planned to slaughter them because it's a sort of moral reckoning for me, a life-long meat eater. As Michael Pollan pointed out in his excellent Omnivore's Dilemma , too many meat eaters "look away" from the realities behind the meat they consume. While I'm aware of many of the issues and I now source my meat locally from sustainable and humane farms, there is still a difference between slaughtering the animal myself and purchasing a dressed and packaged piece of meat. I won't say that I was eager to kill the girls, but I was, in a way, looking forward to taking that final piece of responsibility for what I eat and how I live. I expected to feel a sense of honesty and respect towards the hens, even as I was killing and eating them. It was to be a way of facing the relationship I have with animals directly, instead of turning away. And then there's the whole competence issue which Sharon discussed yesterday. I feel very strongly that I don't want to be a helpless dependent of my food system - local, and sustainable, and humane as it may be. I want to have the knowledge and the skill it takes to slaughter a chicken and put it on the table. I want to know, intimately and directly, that the animals I eat had good lives and humane deaths. So, to my quandary. A real farmer friend of mine asked how my hens were doing. When I told her that they were still laying pretty well, but that I planned to slaughter them before Thanksgiving, she asked the obvious question: Why are you slaughtering them if they're still laying well? I then explained their ages and that I had no winter setup for them. Her reply was "I'll keep them for you over the winter. You can have them back in the spring if you want them." This produced a cascade of thoughts and feelings that really surprised me. I wasn't initially at all pleased by this un-looked-for offer. I've been preparing myself for the slaughter for so long, that I felt disappointment about not getting to do it. I've been looking forward to seeing whether a three-year-old hen can be turned into a decent coq au vin. I've been looking forward to developing those new skills, and to being able to say, "yes, I did it; I can do it." The strength of my own reactions surprised me. And then there followed the more rational side that talked me down from my emotional response: they can have a few more months of a good life. I can still slaughter them in the spring. Not having to slaughter them now frees up the better part of a day later in this busy month. Still, I wonder about my initial reaction, which was a strong disappointment. I haven't yet given her an answer, but I guess I'm going to agree to it. I'm glad that the girls will live a little longer, and that their continued potential as egg producers will not be wasted. I just wish that there were a way to have my hens, and my moral reckoning too. Update: The girls were finally dispatched in late July, 2009. You don't need anything they're selling. Really. Frugality is easier when there are fewer temptations. And guess what? If you never see the stuff in those catalogs, you'll never talk yourself into buying any of it. And you won't miss any of it either. What the eye doesn't see, the heart never mourns. Did you know that 60 million trees are cut down annually in the US just to create the junk mail catalogs that inundate our mailboxes? Scandalous! And that says nothing about the oil that is wasted moving that timber, that paper, and the finished catalogs around until they wind up in said landfill. So tackle that pile of unwanted and wasteful catalogs a little bit at a time. Call a few each evening for a week. And here's a few tips. Once you get a representative on the line, be sure to ask if they maintain the mailing list for any other catalogs, other than the one you're calling about. If so, ask them to remove you from all the distribution lists they service. You'll save a call. And speaking of saving calls, don't keep calling back if you get the same catalogs two weeks after your initial call. Give it three months between fits of anti-marketing opt-out calling. It takes a while for you to be dropped from some mailing lists. So don't duplicate your efforts unless it's really necessary. We had that ornamental black cherry tree and the sickly mulberry felled about a week ago. Some of you remarked that the total bill of $400 seemed low. That might have been because we didn't ask them to remove any of the wood or even chip it for us. We've been dealing with the scrub ever since. For the record, it takes an awful long time to trim a 40'+ black cherry tree into pieces small enough to dump somewhere in a small enough pile that it will compost, eventually. We found out that the cherry wood is somewhat valuable for furniture or cabinet making. I have no idea how many board feet we've got, but it would certainly be enough to at least make facing for some kitchen cabinets. Or some furniture. So we're going to hold on to it for now. We figure if we put it somewhere where it will dry down nicely, it'll simply be more valuable in a year or two. Maybe we'll sell it then, or maybe we'll have furniture made for ourselves. In any case, we just need to think about where to stash it for a while. In other yard news, I finally started ripping out the 23 tomato plants I insanely put in this spring. (Next year, no more than 12!) I've long since stopped eating them myself. But the hens still enjoy the cherry tomatoes especially. I expect hundreds of volunteer tomato plants from the seeds they've pooped out. I gave them so many yesterday that they were getting a little blase about them. They're novelty junkies, those girls. With winter coming, it's been hard lately, finding dandelions or other weeds for them that they especially love. Foraging for their food makes me more aware of the change of seasons. I've been giving them some damaged chard still going strong in the garden. I'll miss the girls, and especially their eggs, after we slaughter them in a few more weeks' time. Our apples look beautiful. But the tree doesn't want to let them go yet. We've harvested only about two bushels and change so far. I've been eating some of them with my morning oatmeal and with crepes or blini. We get the ladder out every few days and have another go at harvesting them. I had thought that we would be pressing this week. It must be a very late season apple. We had a much warmer October last year, so maybe that hurried them along somewhat. I'm hopeful that with the black cherry tree no longer shading the apple, we'll see more apples, less sooty mold, and maybe even an earlier harvest next year. Oh, yes. And then there's leaf raking. Plenty of that already, and most of the leaves still on the trees. I remember that last year, when we hosted Thanksgiving, a few family members helped me rake on Wednesday. When everyone showed up on Turkey Day, it was impossible to tell that any raking had been done at all. 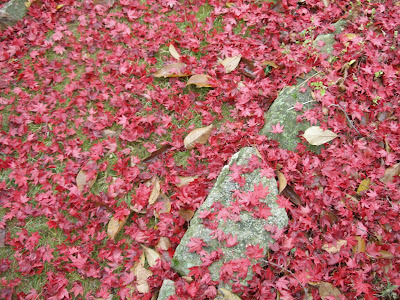 The lawn was covered in leaves. Glad I'm not hosting this year. 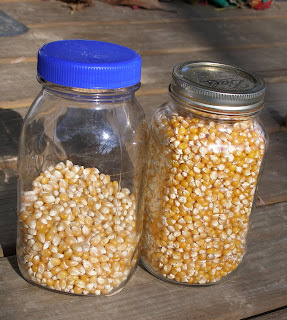 Indoors, I've been removing our homegrown popcorn from the cobs. More on that soon.